The Christmas season can often be characterized by a time of increase: a frenzied pace, material splurges, and even personal grumbling. What often gets drowned out is a quiet and refreshing contemplation of timeless truth. 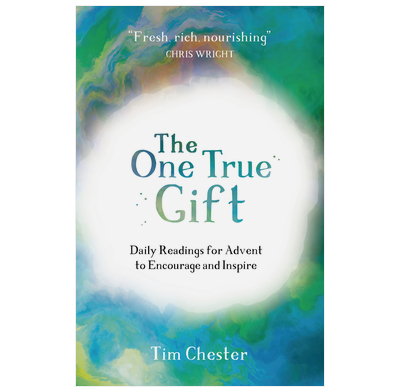 In this short but accessible series of Advent devotions, Tim Chester invites us to go from muttering to marveling this Christmas by considering the most compelling man who ever lived, Jesus Christ. Rich in biblical truth and robust in its theology, The One True Gift is a treasure you’ll want to enjoy this Advent season (or any time, really). Tim does a magnificent work in lifting our eyes to the God-man, Jesus Christ, helping us apply his incarnation, life, death, resurrection, ascension, and glorious return to our daily experience. Take this devotional slowly; there’s so much to see and savor in its pages! Read and pray your way though this Advent book and your Christmas may be very different from previous ones. Or rather, you may be a very different person this Christmas, which is rather more important. Of course, it’s not all about you, it’s all about Jesus Christ, but if you are IN Christ, then actually it is all about you too. Tim Chester fills out the wonderful words of Paul in Philippians with delightfully written short reflections, full of fresh images and comparisons and in a style that is very easy to read, though less easy to live. You’ll feed on some very rich biblical theology, bite-size but deeply nourishing. We read these together as a family (kids are 8&10). They were very thought provoking & resulted in wonderful discussions. Our girls actually got more excited about the readings than their advent calendar treats. The chapters would be a bit long & complex for younger kids & are more suited to adults unless you are prepared to discuss & explain them, but they are itterative, and build logically upon each other. I don't recommend trying to digest more than one chapter a day though, as you are likely to miss some of the deapth & beauty.